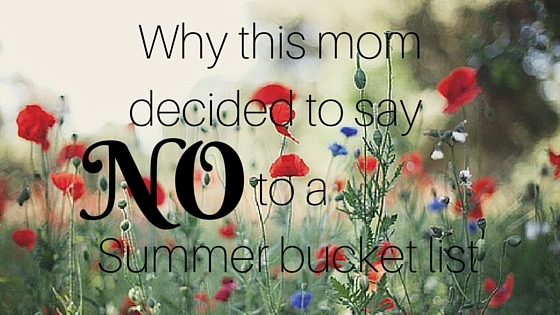 Why this mom decided to say No to a summer bucket list. These first two weeks of June have been really relaxing, which has been so nice! I haven’t done anything significant or gone anywhere, but I have been doing things that are bringing me closer to my goals and I have also been working on my own positivity and not worrying about little things (it’s a work in progress, but I’m getting better at it!). I’ve actually been spending a lot of time out on my deck, digging in the garden, reading, and soaking up the sunshine. I’ve been reading my Bible a lot lately, and it’s helped me to stay grounded and stay inspired. 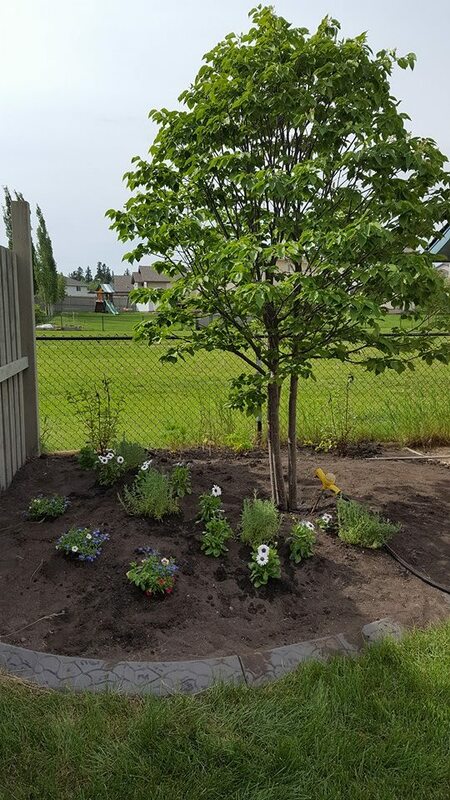 You can’t really see them but I planted two strawberry vanilla hydrangeas along the fence line along with Jessica’s sunflower that she brought home from school. Along the front we have some lavender, purple eyes along with a splash of colour. I also planted a couple of lupine plants that are just starting to bud. And then it dawned on me… it’s JUNE!! It’s also the time of year when you’ll see so many summer bucket lists. We made one last year and it turned into a entire summer series… but this year? I saw all the adorable summer bucket lists splashed all over Pinterest, I thought maybe I should make one, too. They’re filled with fantastic ideas but this year? That’s just not my house. We are going to do some really cool things this summer that I never would have thought to put on our list, like a weekend trip to New York City to take in a Broadway show. We are taking the kids to Ottawa to see the Parliament building for Canada Day. The kids are going camping for the first time in Northern Ontario and we have planned a couple of week long day camps to help fend off the boredom but, that’s where the planning stops. The rest of the year is filled with to-do’s. Between School, Bible study, gymnastics, Fencing our schedules keep us busy. We don’t have as much time for the want-to’s and isn’t the entire reason behind making a summer bucket list is to get as many of them as possible during the summer. And it’s not like each of us doesn’t have in our heads an unwritten list of the things we want to do this summer. Anyone up for a float down the Pembina river? But for me, I want this summer to be different. I want the kids to be able to look back and remember all the fun we had instead of looking at the items not crossed off our summer bucket list and be disappointed. So this year, this mom is saying No to a summer bucket list.. only time will tell if it works or not but for now simplicity wins. I don’t blame you. We don’t do a ton during the summer either. Going places gets super expensive and I try to limit the amount of money that I spend during the summer. We will do a few free or cheap things. If I am lucky to score a review, we do something a bit bigger. Last summer we got to go to Sea World, Legoland Discovery Center, the Aquarium, and Chucky Cheese for events. This year I don’t have any reviews lined up. The only time I keep a bucket list is when we are traveling overseas otherwise our holidays at home are chilled. I think bucket lists are neat and I love to read them but they really aren’t for me. I just want to have a fun summer and not be stuck to a list for everything we want to do. I totally relate and understand why you opted out of doing one! Routines and responsibilities wear on a person, and we are loving the summer easy living and am soaking it all in! Not having a summer bucket list sounds like a great plan. Sometimes it can be very stressful trying to plan and fit everything in during the summer. Taking it day by day sounds like a better way. Summer is always a nice time to relax and not be so busy. We enjoy lounging by the pool instead of running around. We don’t do summer bucket lists at our house. We kind of just wing it and see what happens since everyone has an idea of things they want to do. My teenagers made a summer bucket list this year. They both have summer jobs so it makes any vacations hard for us to plan. Sometimes, I go okay with my summer unplanned. But my boys like doing so many fun things. We sometimes do spur of the moment road trips. It is always great to plan for an awesome vacation but sometimes things do not go the way we want it to. My children are all grown ups so sometimes they have their own activities planned out for the summer. I could not care any less about bucket lists. I don’t even write grocery lists, much less bucket lists. I think it’s just ridiculous. I write grocery lists but only because I don’t want to end up making multiple trips to the store because I forgot something small. Thankfully it’s just down the street but who wants to go there every day?!? I feel the same way, I would like this summer to be a little different, too! I like your idea! I think each of us has to do what feels right for our own family. sounds like bucket lists can be a lot of pressure. I think the disappointment in not getting everything “checked off” was a little too hard on my middle daughter. She is very much a list person and likes to see everything ticked off. Here the weather can be so unpredictable its tricky to try and squeeze everything in before the rain comes. We are going to have a simplistic summer this year too. Usually it’s filled with planned out things for the entire summer break, but this year are approaching it differently. I want to simply “be” more. I love the sound of those strawberry vanilla hydrangeas! They are beautiful! I am hoping to go to the greenhouse and pick up a couple more for the other side of the shed. I peaked yesterday and they were already starting to bloom. We don’t do summer bucket lists either. We love to do things spontaneously. You know what? I actually like your way of thinking. Sometimes simplicity and just winging it is the best way to go. I TOTALLY get this. There is a dark side to a bucket list. That’s the frantic struggle to get to everything. The magic is lost when it becomes a job instead of a joy. Exactly! So much of our normal day to day lives is scheduled to the max that I want the kids to have the kind of summer I did when I was growing up. We drank from hoses and play outside for hours. There were no video games we had our bikes. That’s the kind of summer I want my kids to have. Complete with sandy shoes, sun kissed cheeks and lots of fun memories. I love this!! I really think that social media has put a ton of pressure on parents to do so much more then normal. I’m not a mother, but I know a few kids who are over scheduled and I think it’s so sad. Obviously it’s good to have things to do but I think it’s also important for kids to just have downtime. Let kids be kids! I am feeling the exact same way. Things are too busy through the school year and I just want to fly by the seat of our pants and look at all the amazing stuff we did get done instead of a checklist of things to do. I can totally understand that. Summer should be a relaxing time, not filled with the pressure to get things done. I think I really like the idea of skipping the bucket list. It allows you to be flexible, surprise the kiddos with fun things when its convenient and lets kids be bored and come up with their own creative ideas in addition to avoiding disappointment like you mentioned. That is a great idea! I like the idea of no summer bucket lists. I do feel like bucket lists can create disappointment with children if something doesn’t get checked off. Way to go! Can’t wait to hear how it turns out. I love these! We’re so scheduled out these days, it’s nice to just sit back and relax a little right? Enjoy your summer and enjoy every second of it. It seems to fly by so fast. We have a list of things we want to do this summer. Wish us luck! Great idea! We usually have the best intentions of creating a summer bucket list. However, it’s a loose list– meaning we will change it at anytime. I definitely don’t want to feel restricted to only doing things on a list! We aren’t doing a summer bucket list either. I’d much rather pick things at leisure this year. We don’t have summer bucket lists, just things we would like to do and haven’t done, but if we don’t get to it, that’s fine! We are doing something like this for the Summer, but I’m still having my bucket list. We aren’t signing up for camps or organized activities. The list will be just for us to pick things to do at our leisure. Have fun! It sounds like you have a ton going on with fun trips this summer! Bucket list or not your summer will be full! We aren’t doing a Summer bucket list either. I just want to relax and go wherever the sunshine takes us. I think it’s wonderful. You only get so many summers with kids. Our summer vacation didn’t even start yet because in the northeast we get out next week and then school starts up again in September. I don’t have a bucket list this year, but I do have camp and travel plans for all.